We analyzed the potential influence of anion–π interactions on the stability of complexes of proteins and halogen-containing non-natural amino acids. Anion–π interactions are distance and orientation dependent and our ab initio calculations showed that their energy can be lower than −8 kcal mol−1, while most of their interaction energies lie in the range from −1 to −4 kcal mol−1. About 20 % of these interactions were found to be repulsive. We have observed that Tyr has the highest occurrence among the aromatic residues involved in anion–π interactions, while His made the least contribution. Furthermore, our study showed that 67 % of total interactions in the dataset are multiple anion–π interactions. Most of the amino acid residues involved in anion–π interactions tend to be buried in the solvent-excluded environment. The majority of the anion–π interacting residues are located in regions with helical secondary structure. Analysis of stabilization centers for these complexes showed that all of the six residues capable of anion–π interactions are important in locating one or more of such centers. We found that anion–π interacting residues are sometimes involved in simultaneous interactions with halogens as well. With all that in mind, we can conclude that the anion–π interactions can show significant influence on molecular organization and on the structural stability of the complexes of proteins and halogen-containing non-natural amino acids. Their influence should not be neglected in supramolecular chemistry and crystal engineering fields as well. 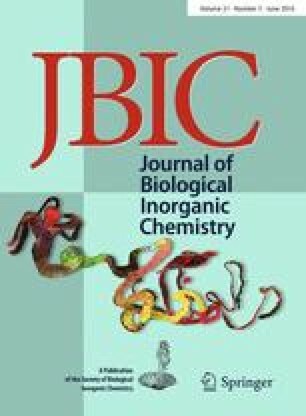 The online version of this article (doi: 10.1007/s00775-016-1346-y) contains supplementary material, which is available to authorized users. This work was supported by the Ministry of Education, Science and Technological Development of the Republic of Serbia (Grants Nos. 172001, 172055, 173034).